I am trying to run cloudmap on galaxy according to the video published on galaxy tutorial, however, when I tried to run published workflow, it did not work at all, and seems to me there is something going wrong with step 23, please the snapshort of screen, I have not clue what this means? 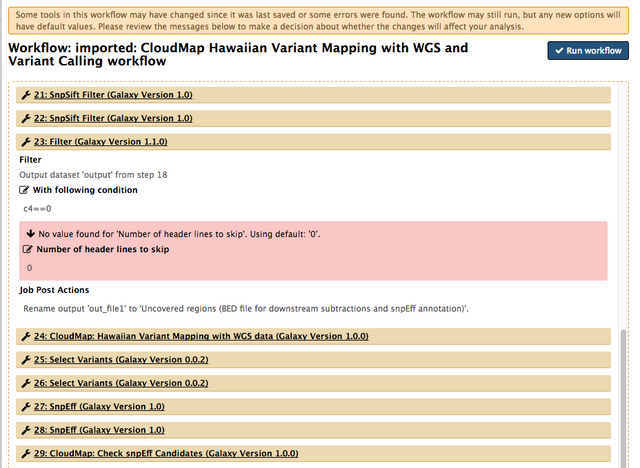 Mapping with BWA Illumina - does not start! Is there a command line example/instruction of the CloudMap workflow?